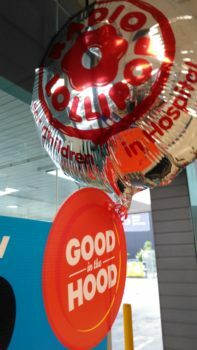 Radio Lollipop Waitakere & Radio Lollipop KidzFirst are both one of the four groups being supported through Good in the Hood at Z Lincoln Road, Lakewood Court & Highbrook Park. That means we'll get a share of $4,000 but how much depends on how many votes we get. To vote for us, all you need to do is buy something from Z Lincoln Road, Lakewood Court & Highbrook Park during May and you'll be given an orange token to put in the voting box. So please head down to Z Lincoln Road, Lakewood Court & Highbrook Park during May and vote for us! You can also support us by encouraging people you know to vote too by posting on Facebook or Twitter. If you aren't in NZ you can still vote online. You can get an extra vote simply by downloading and registering for Z App (our smartphone app). Volunteers have donated 24 hours on the forecourt encouraging votes and receiving donations! You too can show your support of our littlest satellites today! Help us prove Radio Lollipop extends beyond a moment on the ward and beyond your own stations. Simply share on facebook to encourage a vote for Radio Lollipop and include "@ZEnergyNZ" in your comments.